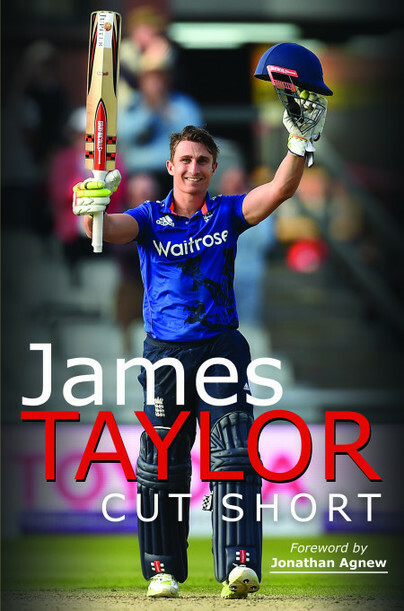 You'll be £6.39 closer to your next £10.00 credit when you purchase James Taylor: Cut Short. What's this? James Taylor was born in Burrough on the Hill, Leicestershire, in 1990. A sporting phenomenon from an early age, he chose to forge a life in cricket, establishing himself as one of the country’s leading batsmen and an England regular. In April 2016, a serious heart condition left Taylor fighting for his life in the changing room. Told he faced possible death if he played cricket, or exercised, ever again, James’s bright and brilliant career was over at the age of 26. In Cut Short, Taylor reveals his route to the top. On the way, he describes how he encountered prejudice against his size and how his Test debut was overshadowed by the negative attentions of Kevin Pietersen. He takes us through the highs and lows of his international career, including a century against the Australians and a closeup view of the unsavoury nature of David Warner. With the world at his feet, Taylor reveals just what it was like to have sporting ambition snatched away right at the point of international breakthrough. He relives in breathless detail the horrific events of the day he thought he was going to die and his desolation at watching a fine sporting career torn from his grasp. The aftermath was a battle bigger than any he ever encountered on the pitch, a battle to rebuild his life and make sense of the personal bombshell with which he had been afflicted, and, unexpectedly, a battle for his future. At the same time, he was getting used to a body which, on several occasions, left him fearing for his existence. That James has emerged from these dark days with courage, good humour, and renewed ambition is testament to a remarkable personality. Cut Short is the story of a true never-say-die character. Even as England completed their Test summer with a 4-1 victory over India, amid tributes and tears at The Oval for the departing Alastair Cook, worries about their top-order batting nagged away. Recent years have featured more walk-on parts than the average Marvel movie, players moving up and down the order in the manner of sailors climbing the rigging, and a solid line-up an increasingly distant memory. One of the men who briefly occupied a berth in England's evanescent middle order - and hinted at long-term stability, too - is now among the sages who selected the Test squad for Sri Lanka, the first without Cook in more than a decade. It was in the strength-sapping heat of Colombo on England's tour four years ago that James Taylor finally came of age as an international cricketer, and by the following winter he was back in the Test side too. Then came the bewildering sadness of his retirement at age 26, following the discovery of a heart condition that nearly killed him. Wow - Cut Short is a fantastic read. His story will touch and inspire every reader!! Well done James - fantastic!!! What a challenge James has faced. I enjoyed reading this account of his struggles and his way of coming to terms with and overcoming some of his difficulties. Well done James! This is a well-written book that tells the story of how an individual can bounce back from adversity, with the right sort of love and support from friends and family, a fate that sadly befell James Taylor, just when he was on the verge of establishing himself as an international England cricket player. James Taylor comes over as a decent sort, with his life being put into some perspective by his daily battle against the heart condition he suffers from. The chapters that deal with his diagnosis and his gradual coming to terms with a career ending bolt from the blue, are heart-rending and will certainly make the reader wince at the detail... this is a quality memoir that shows a genuine human being doing his best to literally cling onto life in an ever-changing world. Well done to you James and long may you last. Article: "James Taylor was a classy batsman against spin whose career was cruelly ended by a severe heart condition. He has just released his autobiography." A remarkable story and deserves to be a resounding success. A remarkable account of James' career, the manner in which it ended and the two very strange years since. * * * * * Great book! * * * * * Amazing book! Such an inspiring book, a really great read that I’d recommend to anyone. Fantastic story of an inspirational guy - a must read for any cricket fan or anyone looking for a true tale of overcoming adversity and showing resilience when life is thrown off course. * * * * * An inspiring story! I wouldn’t consider myself a cricket fan but I picked up this book because I had read about your [James Taylor] story in the news and was so amazed by your incredibly strong response to such a tough situation. What was meant to be a casual read for my commute to and from work turned into me finishing it over the weekend! A brilliantly written, inspirational and moving read for anyone who enjoys a good book. Thank you for sharing your journey and wish you all the best. * * * * * Incredible read, a must have! I’ve followed James’ story since I saw his test debut at Headingley back in 2012. It’s truly tragic that his career ended so suddenly and in such a horrific manner. His book is one of the best sports memoirs I’ve read, incredibly honest and also highly moving at times. He gives an insight into the life of a professional cricketer and reveals the struggles he endured to make it to the top. Then tragedy strikes and the chapters where he tells of the moments he thought he was dying, the agonising wait to find out what the problem with his heart was and how much it would affect his future are breathtaking. I couldn’t put the book down! Combine this with his thoughts on the infamous Kevin Pietersen, the ‘win at all costs’ Australians and his general humour and this all makes for fascinating reading! A really nice touch was asking his wife Jose to write a chapter telling his story from her perspective. This really brings his story home that he isn’t just an international sportsman, but just another guy with family, friends and all the worries that hopefully most of us will never face. How he has moved on from all this is inspiring and this is a book not just for cricket fans, but anyone who enjoys a really strong biography. * * * * * A must must read! This is an absolute must read. Truly emotional story of one of life’s true fighters! A hero of many and inspirational to millions! As featured in a Telegraph exclusive. James Taylor is now retired from professional cricket and now works in the media. He is a regular pundit for Sky's coverage of the England cricket team, works on the BBC's Test Match Special show and has a column in the Evening Standard. He also works with a number of leading heart charities to raise awareness of heart defects and spends time helping individuals and families who suffer from heart problems.